Priya Prakash Varrier is the lastest internet sensation and it is trending on top on most of the social media and video sharing sites like Youtube. Her Video is getting viral on the internet during the Valentine week. 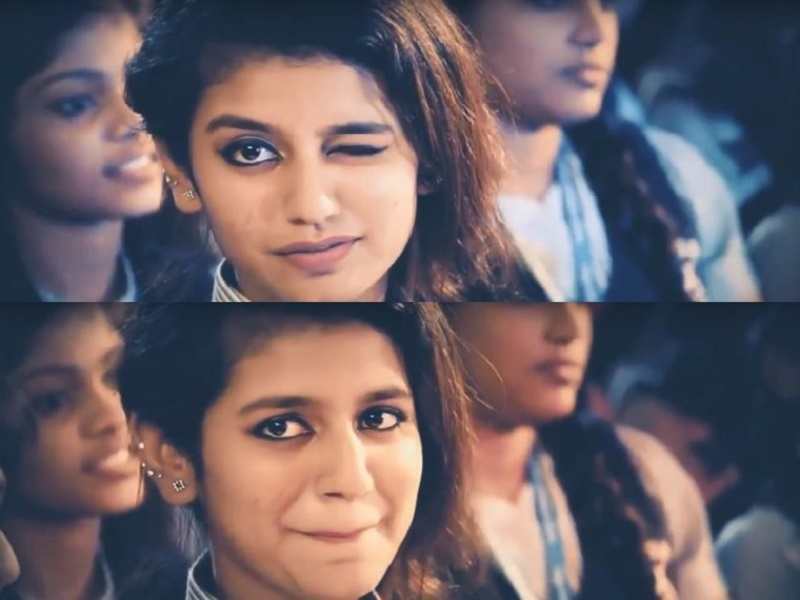 If you came across this page finding more information about the Priya Prakash Varrier, I am damn sure you have already seen her video in which she winks her eye to a guy during a college function. Her facial expressions are getting viral and lots of Memes have been created by FB groups. In this post, I am sharing her details like age, height, weight, family and more pictures of her along with viral youtube song. Priya Prakash became the internet sensation all of a sudden with her killing Wink. She was termed as National Crush after the success she gained. It was a small clip of her first movie which got her such popularity. And it all came to her at an age of 18 years, truly amazing. We can’t even imagine achieving something this big at that age. The clip which got her this popularity was “Oru Adaar Love”. The social media was filled with her Wink and you can’t resist falling in love with the girl. Right after the viral Wink, she became the internet sensation and got more than 600 thousand followers in just one night. The count just kept on increasing and the internet can’t get over her. A girl from Kerala, who is now the nation’s crush. You can check out her Wiki, Age, Height, Weight, Family, Controversies, Net Worth, Biography, & More. Dethroning Sunny Leone, Priya Prakash Varrier has become India’s most searched celebrity in 2018. She has gained such a popularity in a very small amount of time and at a very young age. We have shared many important things about her, take a look. Priya Prakash Varrier is a newcomer Malayalam film actress and she is ready to make her debut in Malayalam movie named “Oru Adaar Love“. Director of this movie is Omar Lulu, he also directed Happy Wedding in 2016 and Chunkzz in 2017. The scheduled release date of the movie is 3 March 2018. After the release of Manikya Malaraya Poovi Song Video song, this girl is getting very famous and Video is trending on top in youtube. The whole internet is got mad over the girl’s cute expression. Till now most of the information is incomplete as she is not a renowned actress. She is ready to make her debut, therefore, more information about her might be available after few days. We tried to compile this information from multiple sources and will update the more information very soon. This Beautiful actress is 19 years old now and weights approximately 50 Kg (110 LBS). Her height is 5 Feet 4 Inch. The 19 years old actress has debuted in Mollywood By her film Oru Adaar Love, which was released on 14 September 2018. She was very widely popular even before the release of her first film. This was a golden opportunity for her to be in limelight, as it will certainly help her in her career. She is getting any offers from various Filmmakers. Recent reports suggests that she might act in Tamil director Nalan Kumaraswamy’s next project. The actress in well trained in dance and music as well. She was seen singing “Channa Mereya” from the movie “Ae Dil Hai Mushkil” in one of the video that went viral. She has been approached by few Bollywood directors as well. We hope that Priya Prakash Varrier Bollywood Debut happens soon. The actress keeps the internet busy by posting videos. Her most viral Wink song video has garnered more than 83 Million likes till now. She started her modelling career in 2017 and appeared in many events as well. Priya Prakash belongs to a Hindu Non-Brahmin Family, Ambalavasi (temple-personnel). She has a younger brother and her father (Prakash Varrier) is an employee of Central Excise Department. Her Mother (Preetha Varrier) is a homemaker and help. Priya Prakash Varrier is rumoured to be dating Hrishikesh Saji. However, the news is not yet confirmed.